Which hotels are closest to the Pahrump airport? 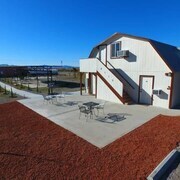 Where to stay near top Pahrump attractions? What kind of hotels are in Pahrump? Which hotel chains are in Pahrump? Budget-minded travelers will find good deals in Pahrump, and visitors give high marks for the casinos and top-notch restaurants. This welcoming city also attracts tourists with its parks. 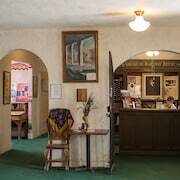 In Pahrump, there are 13 hotels and other accommodations to choose from. The city's natural setting is picturesque, including the parks and Lake Mohave. 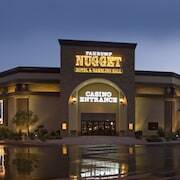 A couple of additional sights to add to your agenda are Yucca Mountain Science Center and Pahrump Nugget Casino. 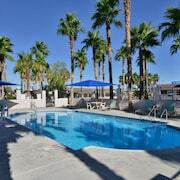 Holiday Inn Express & Suites Pahrump - This 2.5-star hotel features free breakfast, an outdoor pool, and free WiFi. It's a favorite with Expedia travelers for its breakfast and pool. 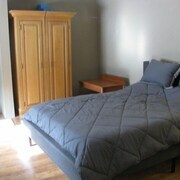 K7 Bed and Breakfast - Our customers like the breakfast and helpful staff at this B&B. With a stay at this 2.5-star bed & breakfast, guests can enjoy access to free breakfast and a restaurant, along with free WiFi. 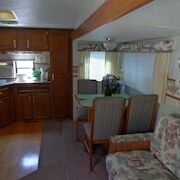 Pahrump RV Park & Lodging - This 2-star campground features free WiFi, free parking, and laundry facilities. 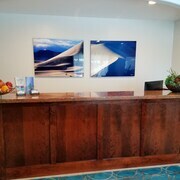 Expedia customers like its overall value and quiet location. 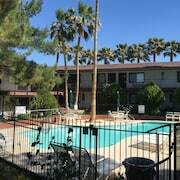 Are there hotels in cities near Pahrump? Explore Pahrump with Expedia.com.au’s Travel Guides to find the best flights, cars, holiday packages and more!